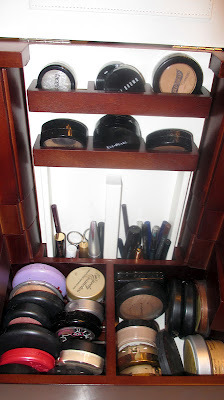 It's a new year and one of my early resolutions was to cut out the clutter and get organized, especially when it comes to my personal makeup! 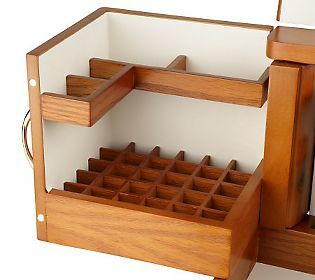 I've gone through numerous solutions that just didn't work - Sterilite drawers, container store organizers, drawer inserts...they just didn't cut it. I scoured the internet for ideas and kept running across Lori Greiner's name. 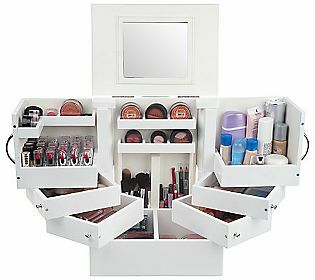 She's a storage/organization guru featured on QVC and I saw quite a few Blog Posts and YouTube videos on her products. By chance we happened to meet on a twitter and I've got a great opportunity to share a review of one of her products. 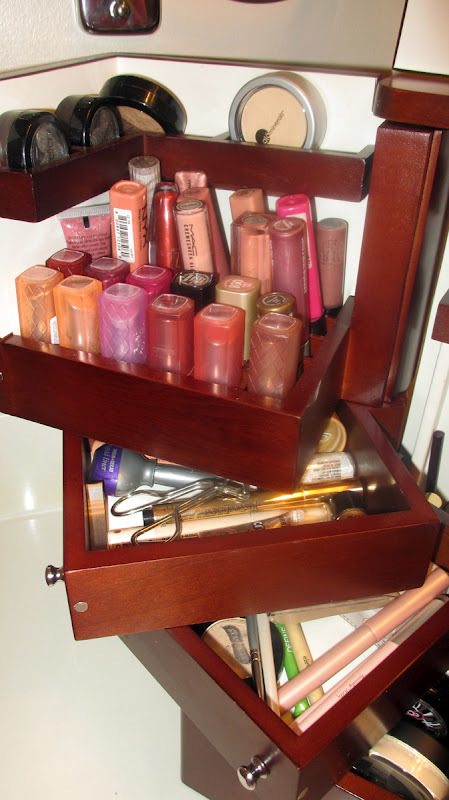 If you're a makeup junkie like me and you're looking for some practical storage solutions, this post is definitely for you! I have a problem with storing my personal cosmetics. 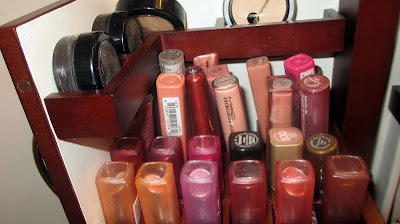 Oftentimes, they're tucked away in various drawers, bags, and train cases. I forget what I have because I never see it. 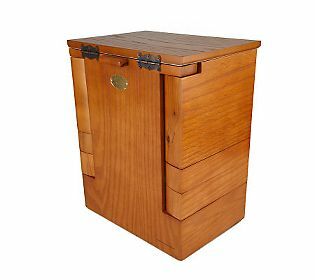 I need something that's sturdy, looks nice, and is easily accessible. The first item I found was Lori Greiner's Cosmetics Spinning Organizer just from random Google and Amazon searches. It's also a great option and very affordable. I could have definitely used this in college! 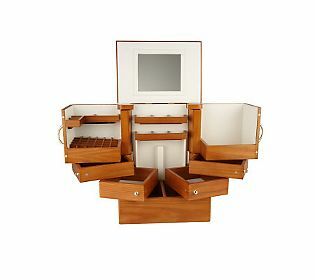 Then I came across the Lori Greiner Deluxe Wood Cosmetic Box which I just think looks a bit nicer and holds more. I was also happy to see tons of YouTube videos on both. 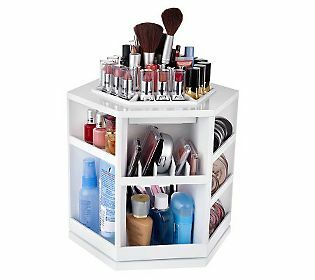 I've found a solution to my makeup organization needs! Measures approximately 14" x 11-1/2" x 8-1/4"
Here's What Mine Looks Like - I chose the Walnut Shade. This is what it looks like closed up. All of the drawers are open...you can slide them out mid-way or all the way out. 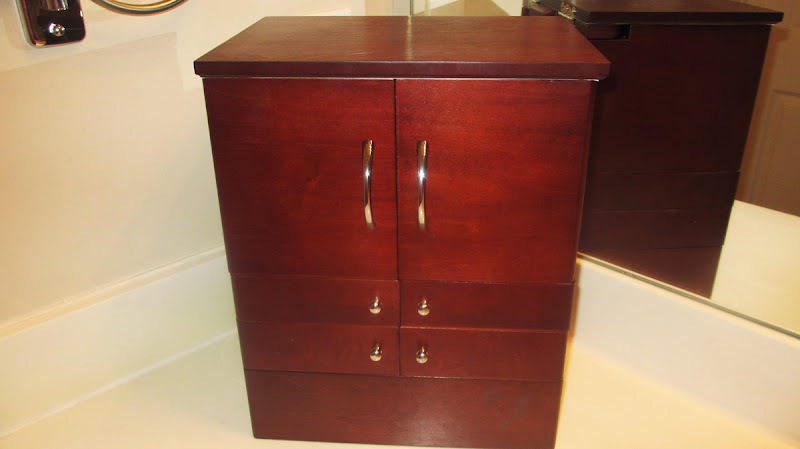 Nice classic look - looks gorgeous on your vanity. I have mine sitting on my bathroom counter. Once you open the vanity you can see all your products...makes you use your makeup a lot more! 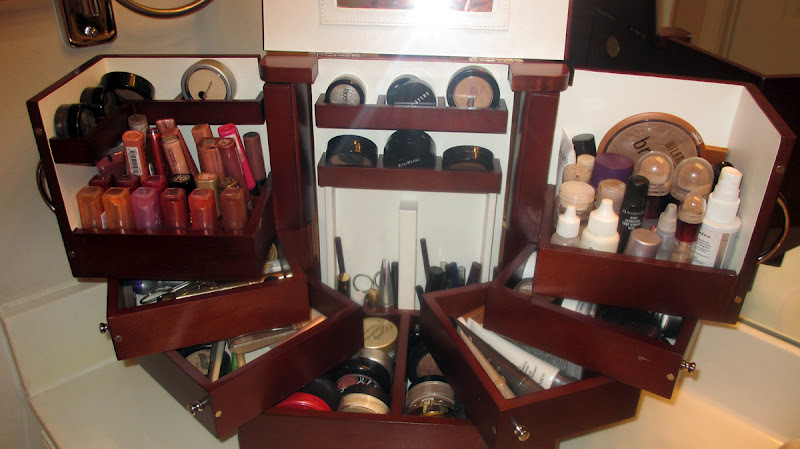 I truly love this makeup organizer. It's made my life so much easier. I'm such a sucker for organization and I truly believe that your life is more calm and happy when you've got space and your items are all in place. I also think that in order to use your products, you have to see them. This cosmetic organizer has allowed me to keep my personal cosmetics in plain site, but I can conveniently close the box to hide everything away but it still looks nice! I think it even makes my bathroom counter look like it has an upgrade lol. My friends and boyfriend have all seen this case and everyone loves it! The piece is a bit of an investment at $76, but honestly I haven't found anything that's comparable to it. I think we've all gone through our cheaper storage solutions such as the Sterilite Drawers - and found that they end up looking dingy and breaking down after time. 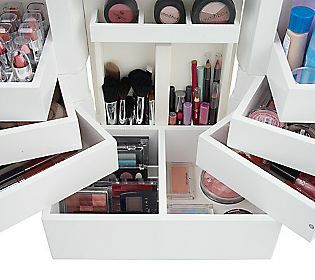 Keep in mind, if you're a makeup junkie like me, you're not going to be able to fit in all of your makeup in this box. However, I'm able to place my most loved and most used items in there. I find that this forces me to condense my collection. 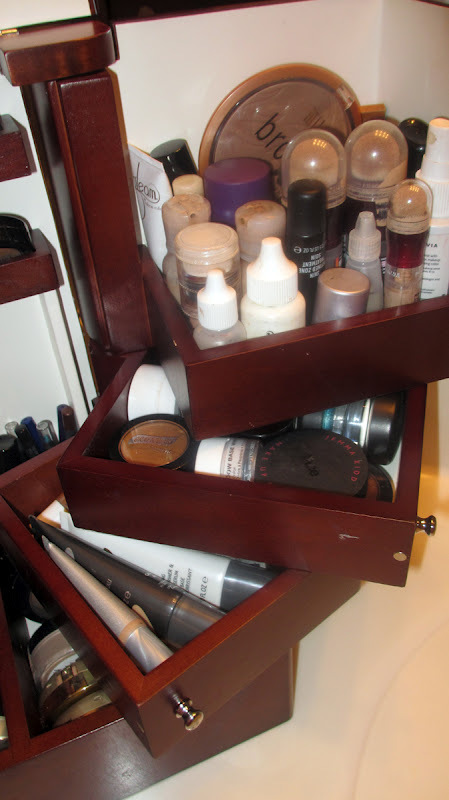 When I do my makeup, I can work straight out of Box without having excess clutter on my counter. It holds enough to give me options without looking like a makeup train exploded on my vanity. I definitely recommend this to everyone! wow it looks really nice. But its bad as you said its hard to move . Where do you put your pallets? Wow ... this looks so so ... organized and easy on the eyes! I'd love to purchase one! Gorgeous! 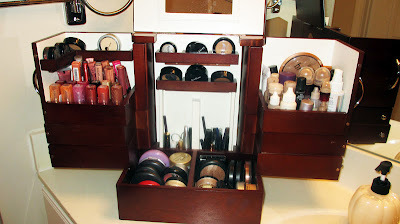 What a perfect system to store your make-up. Hi Ren! I am desperately trying to find something to organise my make up, and this looks like the perfect solution! But I can not order it anywhere :( Is it already discontinued? Can you help me find it somewhere? I would be soooo grateful!